Nothing can compare with spending several days deep into the forest. I even lost count of the days ! My gibbon friends are amazing. « Acrobats of the forest » is a perfect name for them. Their sense of balance remains a mystery. With them I flew up to the limits of their natural habitat where the cultures start and kieep on encroaching on their territory. High adrenaline also when we met poachers. Fortunately they did not find us. Gibbon meat or for the pet trade is sadly very popular. Gibbons are also great vocalists. No need any alarm clock in the morning ! How can we imagine this forest without the fine tune of their voice ? What a nice and relax week-end before flying around the forest tomorrow ! - the purchase of educative material in order to set up an eco-library. So much joy around but I will hold another surprise until the end of my stay. Chat to you soon ! 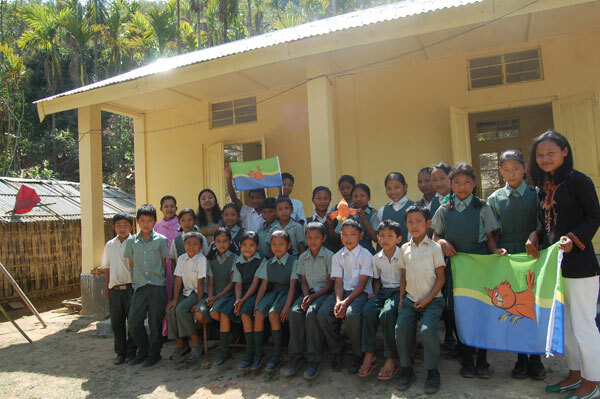 This school is located near the Nokrek National Park in the Western Garo Hills in the State of Meghalaya, India. It’s the most humid place in the world but today we have a beautiful sunny weather ! 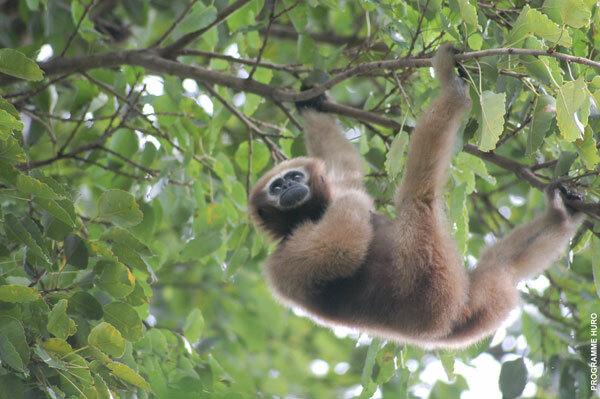 HURO PROGRAMME has established a sanctuary for the Western Hoolock gibbon here. They have also fully understood that this generation of kids is key to the future of not only the gibbons but also the forest and the local eco-system. kids going to school thanks to gibbons and who later will help those monkeys. That’s the way I see successful conservation ! That’s also the reason why I travel so much and this is what ECO-SYS ACTION is all about. I will rest this week-end and I hope you too ! But Monday there will be a big news for the school. In the meantime you can go and check the work of Florian and the HURO team here. Today it’s a privilege to meet Betsy, the Principal of the Silsotchigre Wildlife Medium english school and all my little friends. 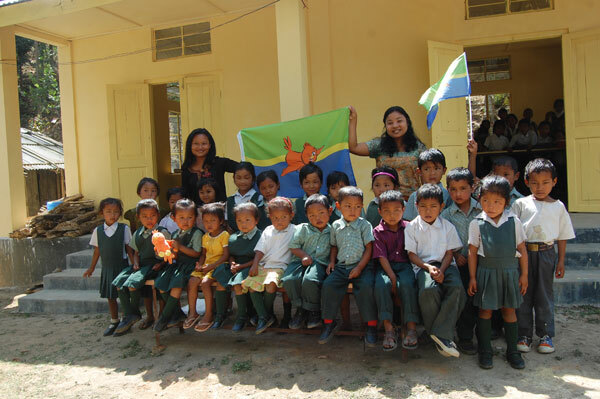 More info tomorrow on how the Huro Programme gibbon’s project help the school. Here are the "acrobats of the forest"! Before I reach my destination, let’s learn a few things about the gibbons we are going to visit. 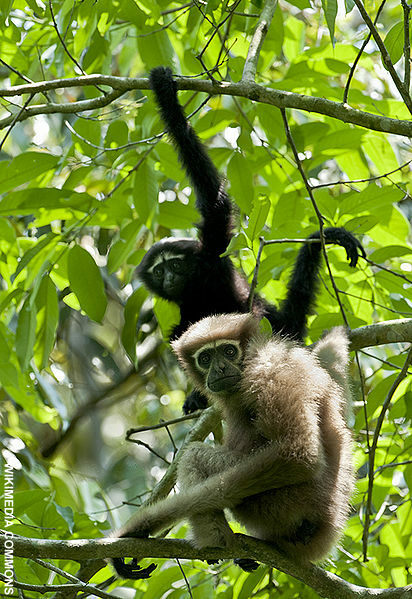 The western hoolock gibbon (Hoolock hoolock) is found in North-East India, Bangladesh and Myanmar. This monkey lives in dense forests and eat fruits, leaves and shoots. Habitat encroachment, forest destruction and poaching are the main threats. In the last 50 years, over 90% of their population has disappeared down from 100,000 to only 5,000 individuals! If India does not want to lose its biggest monkey it has to act quickly and swiftly. But where I am flying now there are quite a few positive surprises! The other threat to owl is not rural but urban. 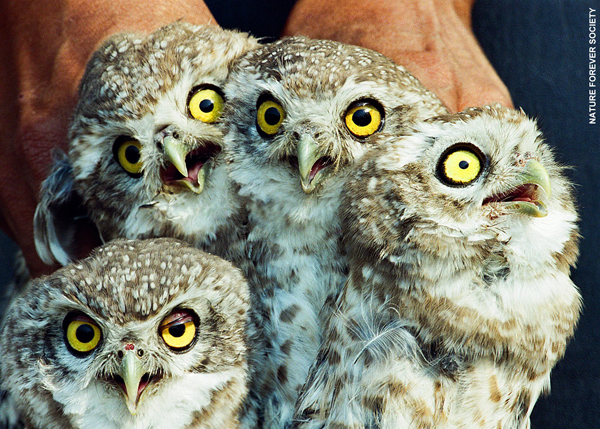 Harry Potter is blamed for fuelling India owls' demise. Many fans of the boy wizard have bought owls on the illegal wildlife trade market as a fashion symbol. Here also there is much information to spread around about keeping owls in the wild. 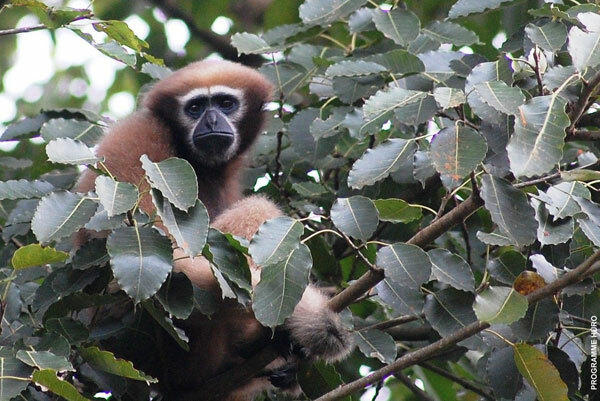 It's time now to leave to the North-Eastern forests inhabited by gibbons. but not before a fond farewell to Mohammed, sparrows and bird's best friend (http://www.ecosysaction.org/world-sparrow-day/). Unfortunately, what has happened to this owl was not rare. Thousands of owls are captured every year in India, mostly for black magic and sorcery driven by superstition mostly in rural areas. 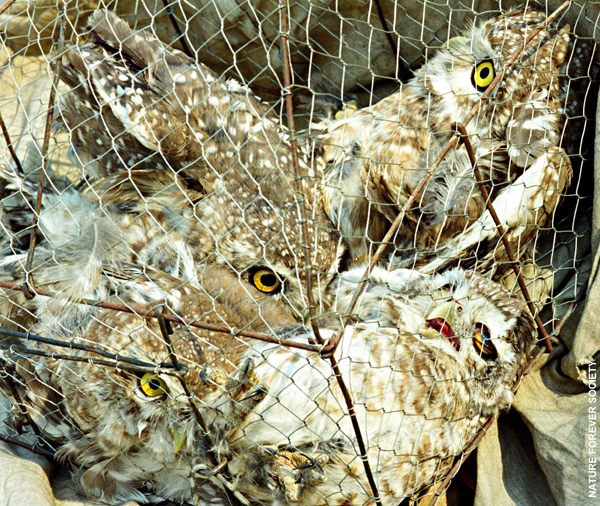 This illegal trade is all the more important in the weeks leading to Diwali, the festival of lights, where so many birds are sacrficied. Streets are so busy here but still we are able to reach the temple on time. As we have been told, a man stands there with a captured owl, he is a shaman called a tantrik. After discussing with the man, the latter has no choice but to give away his pet owl to Mohammed. Transfered in a refuge, the owl will hopefully be reintroduced in a nearby forest if all is well. But is this an isolated case? Before reaching Programme Huro on gibbon conservation in North-East India, I need to urgently meet my friend Mohammed Dilawar of the Nature Forever Society http://natureforever.org/ . An investigation on the illegal owl trade lead him a temple nearby. FSC forest field trip, Perak (Malaysia).